Bathroom stalls for total privacy represent an ideal blend of function, aesthetics, and user amenity. You have to think about a blend of these three factors any time you are developing a new restroom design. This holds equally true for both new constructions and renovations. New build outs are expected to look new by offering a blend of the latest fixtures and accessories and an interior design that reflects a certain awareness of decorative trends. Remodels can be even more demanding than new constructions because these projects are usually undertaken with a limited budget. Expectations are typically just as high as they are for new constructions, yet funding for these expectations is severely limited. Organizations have to make some very tough calls when determining bathroom design priorities. If only one or two things can be replaced with available budgets, the things that matter the very most to a user are the things that need to be upgraded. Without question, the total privacy of your bathroom stalls is going to rank near the top, if not at the very top, of any priority list you make. People will use practically any mirror you hang on the wall so long as it does not distort their reflection and as long as it is cleaned. People will also use lavatories that are years behind the times so long as the sinks and faucets are kept clean. People will also use a trash can even if it is already filled to the brim with refuse—so long as whatever they are throwing away does not fall back on them. Few users purposefully throw paper towels and other waste on the floor, but if these things fall out of the trash after they throw them away, they typically pretend to not notice this and simply leave the room. On the other hand, people may turn right around and leave the restroom almost as soon as they enter it if your bathroom stalls have site lines between the doors and pilasters. Some site lines are as large as ½ inch wide, allowing a person to see into the stall even when the door is shut and locked from the inside. These site lines can be eliminated by adding door jambs to pilasters so that light cannot travel through this gap and generate visibility. Total privacy can be achieved by replacing 55 inch panels and doors with panels and doors that measure 72 inches in height. Toilet compartments built with larger components do require some investment on your part. However, if you have a limited budget that can only afford to partially upgrade your restroom interior, bathroom stalls are the best places to invest those funds because total privacy here ensures total comfort for your user regardless of the aesthetics of other restroom fixtures. 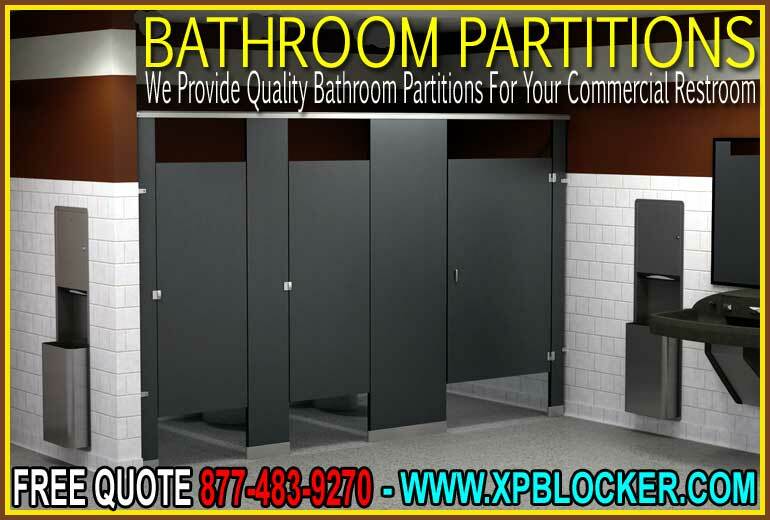 XPB Lockers carries a wide variety commercial industrial sinks, commercial bathroom equipment, commercial outdoor furniture, bleachers, and industrial warehouse equipment delivered nationwide. If you can not find what you are looking for call us toll free at 1-877-483-9270 and we will find it for you. Our home office is located in New Braunfels, Texas with warehouses located throughout the United States that enable us to service all 50 states.